The Tree Walk holiday event, held at the Eagles Club #2368 on Dec. 5-6, raised more than $3,000 for Hospice of the Red River Valley. The donation will support end-of-life care in the region. This two-day event featured beautifully decorated trees that were for sale during a silent auction, a bake sale, a soup luncheon, a pancake breakfast, as well as an appearance from Santa and Mrs. Claus. 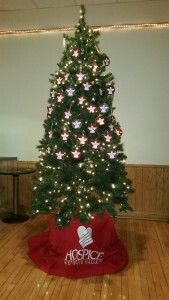 A Hospice Memorial Tree adorned with paper angel ornaments honored the memories of loved ones. The American Legion tree was deemed the most popular tree by a vote from attendees. “Our thanks to the Thief River Falls community and the Eagles Club for their commitment to ensuring hospice care continues long into the future,” said Jane Bartholomay, development officer at Hospice of the Red River Valley. The donation will be used to provide compassionate end-of-life care to those in Thief River Falls and the surrounding communities.